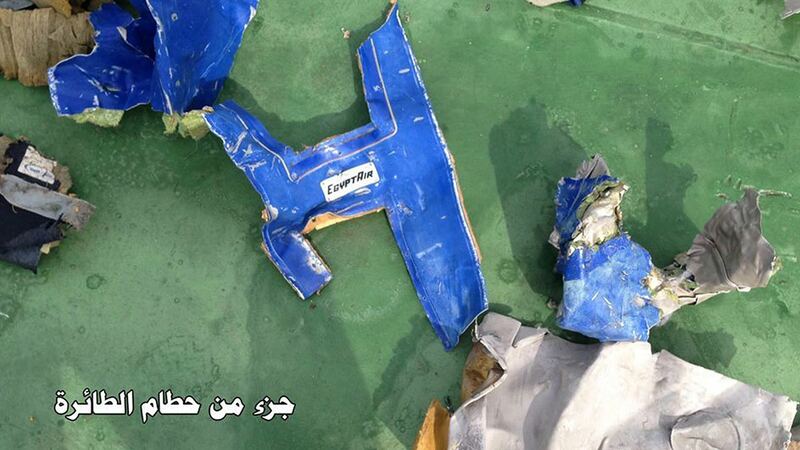 CAIRO -- Egypt said Wednesday that a French ship has picked up signals from deep under the Mediterranean Sea, presumed to be from one of the black boxes of the EgyptAir plane that crashed last month, killing all 66 passengers and crew on board. The development raised hopes the plane's flight data and cockpit voice recorders, known as the black boxes, could be retrieved and shed light on the aircraft's tragic crash. In Cairo, the Civil Aviation Ministry cited a statement from the committee investigating the crash as saying the vessel Laplace received the signals. The French Navy confirmed the Laplace arrived on Tuesday in the search area and picked up the signals "overnight." The signals' frequencies could match with the frequencies of data recorders, a French Navy spokesman told The Associated Press. The location and identification of the source of the signals have not been determined yet, he said, adding that he searches are still at an "early stage." He spoke on condition of anonymity because he wasn't allowed to speak publicly on the issue. Laplace's equipment picked up the "signals from the seabed of the wreckage search area, assumed to be from one of the data recorders," the Egyptian statement read. It added that a second ship, John Lethbridge affiliated with the Deep Ocean Search firm, will join the search team later this week. Locator pings emitted by flight data and cockpit voice recorders, known as the black boxes, can be picked up from deep underwater. The Laplace is equipped with three detectors made by the Alseamar company designed to detect and localize signals from the flight recorders, which are believed to be at a depth of about 3,000 meters (9,842 feet) underwater. By comparison, the wreck of the RMS Titanic is lying at a depth of about 3,800 meters (12,500 feet). Shaker Kelada, an EgyptAir official who has led other crash investigations for the carrier, told the AP that half "the job has been done now" and that the next step would be to determine the black boxers' exact location and extract them from the sea. "We have to find where the boxes are exactly and decide on how to pull them out," he said, adding that search teams might need to send in robots or submarines and "be extremely careful ... to avoid any possible damage." Kelada said he was confident the boxes will be retrieved. He had investigated the Flash Airlines Flight 604 crash in 2004, when the aircraft hit the Red Sea shortly after takeoff from the resort of Sharm el-Sheikh, killing all 148 passengers, most of them French tourists, and crew on board. In the May 19 crash, EgyptAir Airbus A320 had been cruising normally in clear skies on a nighttime flight to from Paris to Cairo when it suddenly lurched left, then right, spinning all the way around and plummeting 38,000 feet (11,582.4 meters) into the sea, Greek Defense Minister Panos Kammenos has said shortly after the crash. However, the Egyptians refuted this, saying that the plane didn't swerve or lose altitude before it disappeared off radar. A distress signal was never issued, EgyptAir has said. "It's terribly important to find the black boxes, because if they don't find them, they will know nothing about the aircraft," he said, citing the 2009 Air France Flight 447 crash in the Atlantic Ocean, when black boxes were found two years later. Nearly two weeks after the crash off Egypt's northern coast, the cause of the tragedy still has not been determined. Egypt's civil aviation minister, Sherif Fathi, has said he believes terrorism is a more likely explanation than equipment failure or some other catastrophic event. In France, Sebastien Barthe, spokesman for the country's air accident investigation agency or the BEA, told the AP that the signal picked up is specific enough - combined with the localization in the search area - to indicate that it comes from one of the data recorders of the EgyptAir flight. Some BEA investigators are on board of the Laplace. Safety onboard Egyptian aircraft and at the country's airports have been under close international scrutiny since a Russian airliner crashed in the Sinai Peninsula last October, killing all 224 people on board, shortly after taking off from an Egyptian resort. That crash - claimed by the Islamic State's affiliate in Sinai and blamed by Moscow on an explosive device planted on board - decimated Egypt's lucrative tourism industry, which had already been battered by years of turmoil in the country. Also Wednesday, Egyptian authorities reported that they had evacuated all passengers from the EgyptAir Flight 960 from Cairo to Bangkok scheduled late the previous night after receiving security threats of a bomb on board. Tarek Zaki, head of security at Cairo airport, said the warning claimed an unidentified assailant had planted a bomb on the plane. A security official, speaking on condition of anonymity in line with regulations, said the plane and the bags were searched but no bomb was found. The threat caused a delay and eventually led to the flight being cancelled.